Share the post "Rutgers Was All the “RAGE” on the 2017 Flower Show Circuit"
Laeiocattleya Trick or Treat “Ty’s Rutgers Triumph,” winner of “Best Orchid in the Show” at the Philadelphia Flower Show in both 2016 and 2017. This showy exhibit was also “Best in Show” winner at the 2017 Southeastern Pennsylvania Orchid Show. 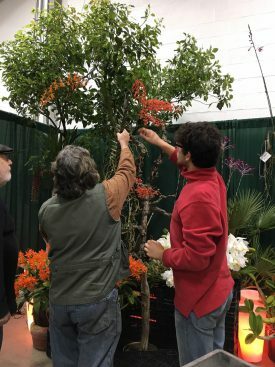 Rutgers University, represented by a loose collection of horticulturists, alumni and students affiliated with Rutgers—all flower enthusiasts—bearing the name Rutgers Alumni Growers and Exhibitors (RAGE), had tremendous success on the flower show and sale circuit this year. 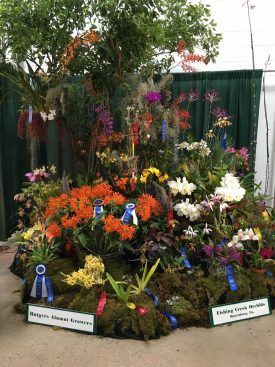 Of the three shows in which RAGE competed this season—North Jersey Orchid Society Show, Philadelphia Flower Show and Southeastern Pennsylvania Orchid Society (SEPOS) Show—it walked away with first place finishes in each event. RAGE won show trophy for “Most Outstanding Orchid” exhibit at the North Jersey Orchid Society Show, which was held at the Douglass Student Center at Rutgers-New Brunswick. 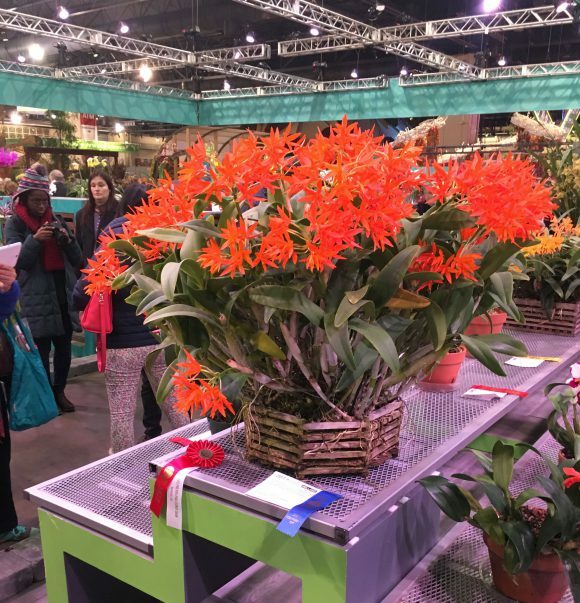 The coveted “Best Orchid in the Show” at the 2017 Philadelphia Flower Show went to Laeiocattleya Trick or Treat “Ty’s Rutgers Triumph.” Blue ribbon honors also went to the orchid, Laelia undulata, a joint entry by RAGE & Fishing Creek Orchid, PA, as well as the succulent, Anacampseros Alstonii. 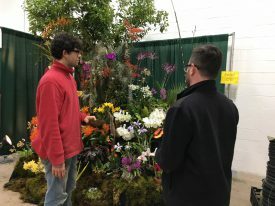 Two exhibits that won top honors at the Philadelphia Flower Show also scored three big wins at SEPOS this year. 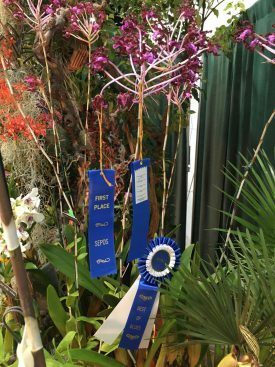 The showy Laeiocattleya Trick or Treat “Ty’s Rutgers Triumph” won “Best in Show.” Taking home both “First Place” as well as the “Best of Blues” prizes was Laelia undulata, the joint orchid exhibit by RAGE & Fishing Creek Orchid, PA. RAGE consisted of Nicoletta Graf (CC’77), manager of Rutgers Floriculture Greenhouse; alumnus Michael Bowell (CC’78) and proprietor of Create a Scene, Inc., which specializes in garden design, installation and maintenance in the Philadelphia area; Ty Triplett (SEBS’10, GSNB’16) for whom one of the winning entries was named; Rodrigo Jordy (SEBS’16); another graduate Chris Satch; and Helen Misiewicz of Rutgers University Housing, a dedicated Rutgers Floriculture Greenhouse volunteer. Among the members of RAGE was a mixture of Rutgers students that included Tiffany Causing, Michaela Kramer, Thyra Kelly, Jacob Ledden, Sarah Pfaff, Lester Sabo, Allison Severino and Ariane Vasilatis. 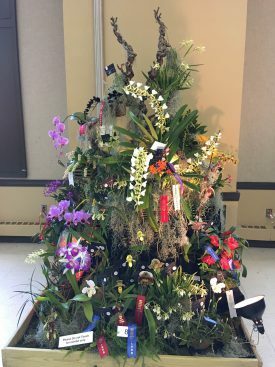 RAGE won show trophy for “Most Outstanding Orchid” with this exhibit at the 2017 North Jersey Orchid Society Show. 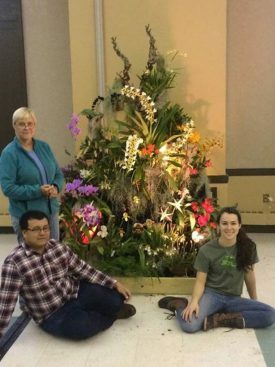 Mary Forsbert, a Rutgers Gardens benefactor, and Rutgers students Lester Sabo and Sarah Pfaff with the award-winning entry at the 2017 North Jersey Orchid Society Show. A joint entry by RAGE & Fishing Creek Orchid, PA, Laelia undulata took “First Place” and “Best of Blues” at the 2017 SEPOS Show. 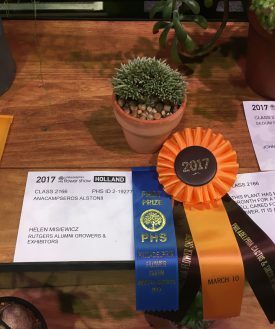 It was also the “Blue Ribbon” winner at the 2017 Philadelphia Flower Show. A close-up look at Laelia undulata‘s two “Blue Ribbons” at the 2017 SEPOS Show. Michael Bowell (CC’78), proprietor of Create a Scene, Inc. in PA, and Rodrigo Jordy (SEBS’16) tend to the RAGE “First Place” and “Best of Blues” exhibit at the 2017 SEPOS Show. Anacampseros alstonii, a succulent submitted by RAGE, won first place at the 2017 Philadelphia Flower Show. Rodrigo Jordy (SEBS’16) and Ty Triplett (SEBS’10, GSNB’16) at the 2017 SEPOS Show with the two-time, award-winning RAGE exhibit.